The Betsy Ross flag is an early design of the flag of the United States popularly attributed to Betsy Ross using the common motifs of alternating red-and-white striped field with white stars in a blue canton. 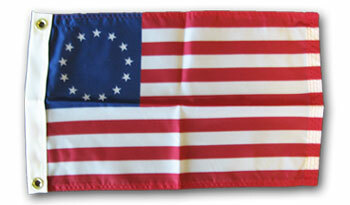 The flag was designed during the American Revolution and features 13 stars to represent the original 13 colonies. The distinctive feature of the Ross flag is the arrangement of the five-pointed stars in a circle. This smaller size is made of 100% Anco Dyed Nylon and is great for boat, trailer or motorcycle applications.